home Articles Is EMF Exposure Really a Big Deal? 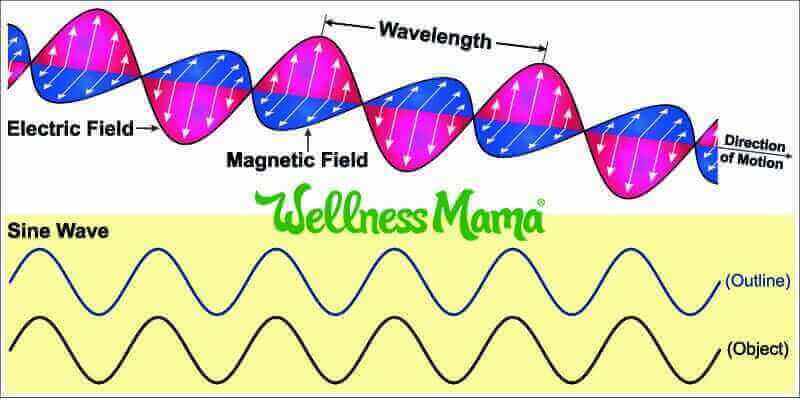 Electromagnetic fields (EMFs) have been around since the beginning of time as we receive natural EMFs from the sun and earth itself. It wasn’t until mankind learned to generate electricity (and EMFs) that we hit technological breakthroughs like lightbulbs and radio communications. More than 100 years later, we now enjoy and have become almost completely dependent on high-performing computers, microwave ovens, and many other wireless technologies. Every one of us is now exposed to unprecedented levels of man-made EMFs. The safety of EMF exposure is controversial because there are the pro-technology people who believe that these artificially created EMFs are completely safe. On the other hand, studies are emerging to demonstrate that EMFs, including non-ionizing ones, may be unsafe. Perhaps the safest route to take is to be safe, informed, and proactive, rather than sitting back and passively consenting to being a guinea pig. To help understand why EMF exposure could be harmful, I’m going to attempt to outline the science that explains it as well as what we can do to help eliminate the negative effects. EMF stands for electromagnetic field. Electromagnetic fields are comprised of an electric and a magnetic field perpendicular to each other, which travel together in an invisible wave form. Near an electrical current, according to Maxwell’s Law. When atoms absorb another form of energy, which can be in the form of heat or another EMF. The electrons in an atom can get excited and release another EMF field. This is exactly how plant chlorophyll extracts energy from sunlight to convert carbon dioxide into glucose. When nuclear reactions occur, such as how the sun creates energy. Many man-made EMFs are generated by one of these methods to create electromagnetic waves that are useful to us. These include radio waves, WiFi signals, and microwave radiation. In addition, visible lights, UV lights, and infrared radiation are also a form of EMFs. The National Institute of Environmental Health Sciences categorized EMFs into two different groups, i.e. Low frequency EMF radiation. They have lower frequencies than visible light and are non-ionizing radiation. 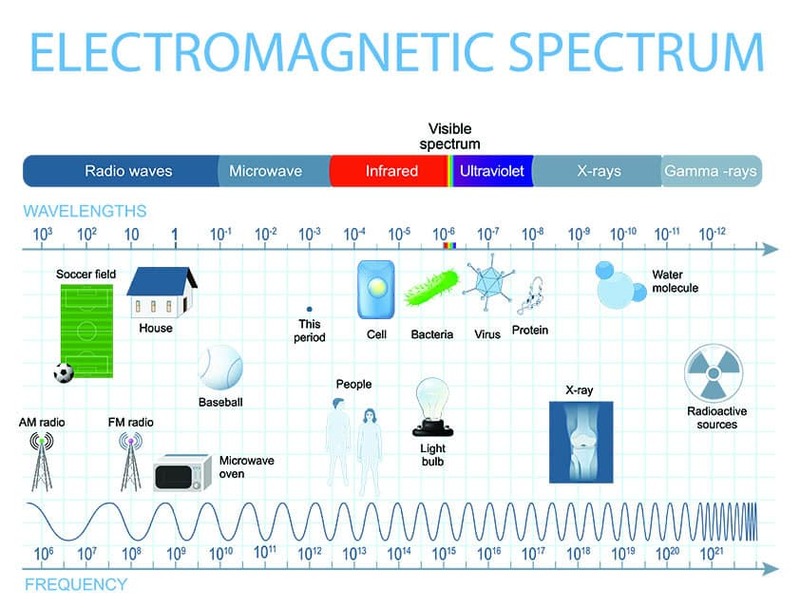 Examples include EMFs from microwave ovens, computers, visible light, smart meters, WiFi, cell phones, Bluetooth, power lines, and MRIs. High frequency EMF radiation. These have higher frequencies than visible light, which are ionizing radiation. Examples include ultraviolet (UV) light, X-Rays, and Gamma rays. There is no question that too much exposure to high frequency radiation can create health problems. If we stay out in the sun too long, we get sunburned from prolonged UV exposure. Every time we get X-Rays, the technician will ask if we are pregnant because X-Rays can cause harm to the growing baby. First, symptoms due to use of microwave ovens, smart meters, WiFi, cell phones, etc. can be inconspicuous at first, but they may become noticeable over time rather than immediately. Second, the electronic and telecommunication industries have strong financial interests in consumers not being aware of potential harm from using their products. Why is EMF Exposure a Problem? We have long known that the human body is a sophisticated electromagnetic system. Our nervous system and our heart run on electricity, which explains why we can shock a dead heart into life using an electric shock machine called a defibrillator. Back in 1969, Dr. David Cohen, professor of Physics at Massachusetts Institute of Technology was able to detect the magnetic fields from the human heart and brain (source). It is important to note, also, mitochondria and liver enzymes also operate based on electrical conductivity and light energy (source 1, source 2). Naturally, we have evolved with the natural EMFs, i.e. that of the earth and the sun which synch with our healthy biological rhythms. Earth has its own magnetic field, which is why we can always use a compass to find the north pole no matter where we are. Earth’s EMF is called the Schumann resonance (7.83 Hz). The sun is a big source of natural EMFs, including visible light and UV radiation. Our own electromagnetic signals are very weak compared to the man-made EMFs. Exposure to man-made EMFs can interfere with the electromagnetic systems inside of our bodies. Particularly, the brain, the heart, and mitochondria can be particularly susceptible to EMF interference. In addition, because our own biology can get disrupted, EMF exposure can worsen inflammatory problems. How Much EMF Exposure is Safe? Frequency: The higher frequency an EMF is, the more energy it carries and the more likely it is to be dangerous. Power density: The average energy of the electromagnetic waves in a given area or volume. Duration of exposure: prolonged duration is usually worse than acute duration for the same levels of EMF. The World Health Organization established a guideline for safe EMF exposure, while different countries also have established their own guidelines. According to a report by Netherland’s National Institutes of Public Health and another report by Dr. Jack Kruse, Russia has the strictest requirements while the US has allows for more EMF exposure. 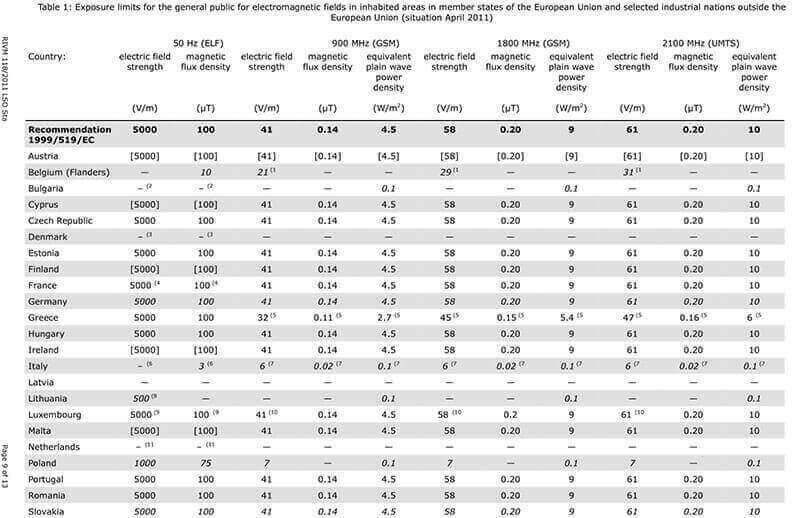 See the full text of the comparison of international policies about EMFs, including the image above in PDF form here. The telecommunication and electronics industry have a major conflict of interest against consumers becoming aware of health effects from EMF exposure. In fact, they might even be in denial. Their safety claims are typically reinforced by government agencies as it can be very expensive for them to make things safer. Currently, the claims that the low frequency EMF exposure is safe are based on the fact that there is no direct evidence showing that certain sources of EMF exposure are safe (or unsafe). The International Agency for Research on Cancer has already categorized low frequency EMF radiation a class 2B possible carcinogen (source). However, harmful effects of EMF radiation are not limited to cancer. An infamous case of such denial was when utility companies started installing smart meters in people’s homes. While the companies claim that smart meters are safe, numerous people started to experience neurological problems and, in some cases, worsened inflammatory symptoms as soon as the smart meters were installed (source). These consumers had to immediately move to a new home with no smart meters or fight to have the smart meter uninstalled in their home. Many parents in Ontario are observing that their children are becoming ill after schools started to install WiFi (source). Children are particularly susceptible to harm from EMF radiation because they have smaller and growing bodies, so symptoms can be more apparent. The organisation is funded solely by income from consultations.